—The external nose is pyramidal in form, and its upper angle or root is connected directly with the forehead; its free angle is termed the apex. The lateral surface ends below in a rounded eminence, the ala nasi. 2 Structure of The Human Nose. —The frame-work of the external nose is composed of bones and cartilages; it is covered by the integument, and lined by mucous membrane. 3 The bony frame-work occupies the upper part of the organ; it consists of the nasal bones, and the frontal processes of the maxillæ. 4 The cartilaginous frame-work (cartilagines nasi) consists of five large pieces, viz., the cartilage of the septum, the two lateral and the two greater alar cartilages, and several smaller pieces, the lesser alar cartilages The various cartilages are connected to each other and to the bones by a tough fibrous membrane. 5 The cartilage of the septum (cartilago septi nasi) is somewhat quadrilateral in form, thicker at its margins than at its center, and completes the separation between the nasal cavities in front. Its anterior margin, thickest above, is connected with the nasal bones, and is continuous with the anterior margins of the lateral cartilages; below, it is connected to the medial crura of the greater alar cartilages by fibrous tissue. Its posterior margin is connected with the perpendicular plate of the ethmoid; its inferior margin with the vomer and the palatine processes of the maxillæ. The septal cartilage does not reach as far as the lowest part of the nasal septum. This is formed by the medial crura of the greater alar cartilages and by the skin; it is freely movable, and hence is termed the septum mobile nasi. 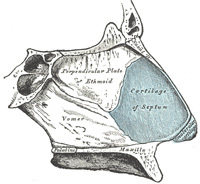 The lateral cartilage is situated below the inferior margin of the nasal bone, and is flattened, and triangular in shape. Its anterior margin is thicker than the posterior, and is continuous above with the cartilage of the septum, but separated from it below by a narrow fissure; its superior margin is attached to the nasal bone and the frontal process of the maxilla; its inferior margin is connected by fibrous tissue with the greater alar cartilage. The portion which forms the medial wall (crus mediale) is loosely connected with the corresponding portion of the opposite cartilage, the two forming, together with the thickened integument and subjacent tissue, the septum mobile nasi. 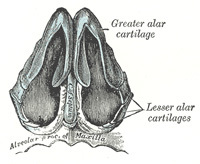 The part which forms the lateral wall (crus laterale) is curved to correspond with the ala of the nose; it is oval and flattened, narrow behind, where it is connected with the frontal process of the maxilla by a tough fibrous membrane, in which are found three or four small cartilaginous plates, the lesser alar cartilages (cartilagines alares minores; sesamoid cartilages). Above, it is connected by fibrous tissue to the lateral cartilage and front part of the cartilage of the septum; below, it falls short of the margin of the naris, the ala being completed by fatty and fibrous tissue covered by skin. In front, the greater alar cartilages are separated by a notch which corresponds with the apex of the nose. FIG. 852 Diagram of The Human Nose– Cartilages of the nose. Side view. FIG. 853 Diagram of The Human Nose– Cartilages of the nose, seen from below. FIG. 854 Diagram of The Human Nose– Bones and cartilages of septum of nose. Right side. The muscles acting on the external nose have been described in the section on Myology. The integument of the dorsum and sides of the nose is thin, and loosely connected with the subjacent parts; but over the tip and alæ it is thicker and more firmly adherent, and is furnished with a large number of sebaceous follicles, the orifices of which are usually very distinct. The arteries of the external nose are the alar and septal branches of the external maxillary, which supply the alæ and septum; the dorsum and sides being supplied from the dorsal nasal branch of the ophthalmic and the infraorbital branch of the internal maxillary. The veins end in the anterior facial and ophthalmic veins. FIG. 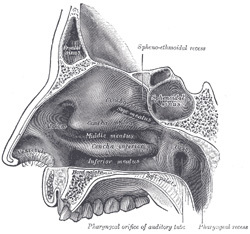 855 Diagram of The Human Nose– Lateral wall of nasal cavity. FIG. 856 Diagram of The Human Nose – Lateral wall of nasal cavity; the three nasal conchæ have been removed. 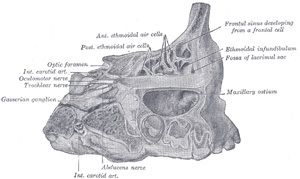 The roof of the nasal cavity is narrow from side to side, except at its posterior part, and may be divided, from behind forward, into sphenoidal, ethmoidal, and frontonasal parts, after the bones which form it. The floor is concave from side to side and almost horizontal antero-posteriorly; its anterior three-fourths are formed by the palatine process of the maxilla, its posterior fourth by the horizontal process of the palatine bone. 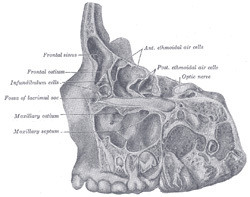 In its anteromedial part, directly over the incisive foramen, a small depression, the nasopalatine recess, is sometimes seen; it points downward and forward and occupies the position of a canal which connected the nasal with the buccal cavity in early fetal life. The Mucous Membrane—The nasal mucous membrane lines the nasal cavities, and is intimately adherent to the periosteum or perichondrium. It is continuous with the skin through the nares, and with the mucous membrane of the nasal part of the pharynx through the choanæ. From the nasal cavity its continuity with the conjunctiva may be traced, through the nasolacrimal and lacrimal ducts; and with the frontal, ethmoidal, sphenoidal, and maxillary sinuses, through the several openings in the meatuses. The mucous membrane is thickest, and most vascular, over the nasal conchæ. It is also thick over the septum; but it is very thin in the meatuses on the floor of the nasal cavities, and in the various sinuses. Owing to the thickness of the greater part of this membrane, the nasal cavities are much narrower, and the middle and inferior nasal conchæ appear larger and more prominent than in the skeleton; also the various apertures communicating with the meatuses are considerably narrowed. —The epithelium covering the mucous membrane differs in its character according to the functions of the part of the nose in which it is found. In the respiratory region it is columnar and ciliated. Interspersed among the columnar cells are goblet or mucin cells, while between their bases are found smaller pyramidal cells. Beneath the epithelium and its basement membrane is a fibrous layer infiltrated with lymph corpuscles, so as to form in many parts a diffuse adenoid tissue, and under this a nearly continuous layer of small and larger glands, some mucous and some serous, the ducts of which open upon the surface. In the olfactory region the mucous membrane is yellowish in color and the epithelial cells are columnar and non-ciliated; they are of two kinds, supporting cells and olfactory cells. The supporting cells contain oval nuclei, which are situated in the deeper parts of the cells and constitute the zone of oval nuclei; the superficial part of each cell is columnar, and contains granules of yellow pigment, while its deep part is prolonged as a delicate process which ramifies and communicates with similar processes from neighboring cells, so as to form a net-work in the mucous membrane. 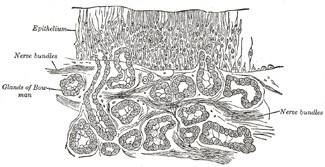 Lying between the deep processes of the supporting cells are a number of bipolar nerve cells, the olfactory cells, each consisting of a small amount of granular protoplasm with a large spherical nucleus, and possessing two processes—a superficial one which runs between the columnar epithelial cells, and projects on the surface of the mucous membrane as a fine, hair-like process, the olfactory hair; the other or deep process runs inward, is frequently beaded, and is continued as the axon of an olfactory nerve fiber. Beneath the epithelium, and extending through the thickness of the mucous membrane, is a layer of tubular, often branched, glands, the glands of Bowman, identical in structure with serous glands. The epithelial cells of the nose, fauces and respiratory passages play an important role in the maintenance of an equable temperature, by the moisture with which they keep the surface always slightly lubricated. —The arteries of the nasal cavities are the anterior and posterior ethmoidal branches of the ophthalmic, which supply the ethmoidal cells, frontal sinuses, and roof of the nose; the sphenopalatine branch which supplies the mucous membrane covering the conchæ, the meatuses and septum, the septal branch of the superior labial of the external maxillary; the infraorbital and alveolar branches of the internal maxillary, which supply the lining membrane of the maxillary sinus; and the pharyngeal branch of the same artery, distributed to the sphenoidal sinus. The ramifications of these vessels form a close plexiform net-work, beneath and in the substance of the mucous membrane. FIG. 857 Diagram of the Human Nose– Section of the olfactory mucous membrane. The veins form a close cavernous plexus beneath the mucous membrane. Some of the veins open into the sphenopalatine vein; others join the anterior facial vein; some accompany the ethmoidal arteries, and end in the ophthalmic veins; and, lastly, a few communicate with the veins on the orbital surface of the frontal lobe of the brain, through the foramina in the cribriform plate of the ethmoid bone; when the foramen cecum is patent it transmits a vein to the superior sagittal sinus. 29 The nerves of ordinary sensation are: the nasociliary branch of the ophthalmic, filaments from the anterior alveolar branch of the maxillary, the nerve of the pterygoid canal, the nasopalatine, the anterior palatine, and nasal branches of the sphenopalatine ganglion. 30 The nasociliary branch of the ophthalmic distributes filaments to the forepart of the septum and lateral wall of the nasal cavity. Filaments from the anterior alveolar nerve supply the inferior meatus and inferior concha. 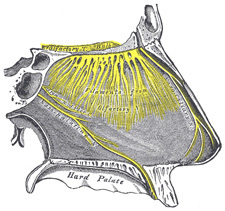 The nerve of the pterygoid canal supplies the upper and back part of the septum, and superior concha; and the upper nasal branches from the sphenopalatine ganglion have a similar distribution. The nasopalatine nerve supplies the middle of the septum. The anterior palatine nerve supplies the lower nasal branches to the middle and inferior conchæ. 31 The olfactory, the special nerve of the sense of smell, is distributed to the olfactory region. Its fibers arise from the bipolar olfactory cells and are destitute of medullary sheaths. The accessory sinuses or air cells of the nose are the frontal, ethmoidal, sphenoidal, and maxillary; they vary in size and form in different individuals, and are lined by ciliated mucous membrane directly continuous with that of the nasal cavities. The Frontal Sinuses (sinus frontales), situated behind the superciliary arches, are rarely symmetrical, and the septum between them frequently deviates to one or other side of the middle line. Their average measurements are as follows: height, 3 cm. ; breadth, 2.5 cm. ; depth from before backward, 2.5 cm. Each opens into the anterior part of the corresponding middle meatus of the nose through the frontonasal duct which traverses the anterior part of the labyrinth of the ethmoid. Absent at birth, they are generally fairly well developed between the seventh and eighth years, but only reach their full size after puberty. FIG. 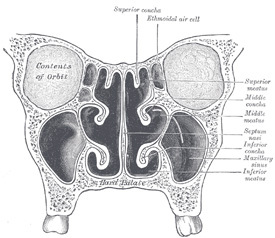 859– Diagram of the Human Nose -Coronal section of nasal cavities. The Ethmoidal Air Cells consist of numerous thin-walled cavities situated in the ethmoidal labyrinth and completed by the frontal, maxilla, lacrimal, sphenoidal, and palatine. They lie between the upper parts of the nasal cavities and the orbits, and are separated from these cavities by thin bony laminæ. On either side they are arranged in three groups, anterior, middle, and posterior. 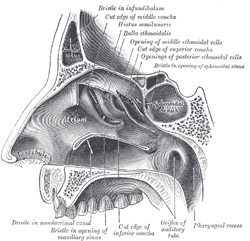 The anterior and middle groups open into the middle meatus of the nose, the former by way of the infundibulum, the latter on or above the bulla ethmoidalis. The posterior cells open into the superior meatus under cover of the superior nasal concha; sometimes one or more opens into the sphenoidal sinus. The ethmoidal cells begin to develop during fetal life. The Sphenoidal Sinuses contained within the body of the sphenoid vary in size and shape; owing to the lateral displacement of the intervening septum they are rarely symmetrical. The following are their average measurements: vertical height, 2.2 cm. ; transverse breadth, 2 cm. ; antero-posterior depth, 2.2 cm. When exceptionally large they may extend into the roots of the pterygoid processes or great wings, and may invade the basilar part of the occipital bone. Each sinus communicates with the sphenoethmoidal recess by means of an aperture in the upper part of its anterior wall. They are present as minute cavities at birth, but their main development takes place after puberty. FIG. 860– —Specimen from a child eight days old. By sagittal sections removing the lateral portion of frontal bone, lamina papyracea of ethmoid, and lateral portion of maxilla—the sinus maxillaris, cellulæ ethmoidales, anterior and posterior, infundibulum ethmoidale, and the primitive sinus frontalis are brought into view. The Maxillary Sinus the largest of the accessory sinuses of the nose, is a pyramidal cavity in the body of the maxilla. Its base is formed by the lateral wall of the nasal cavity, and its apex extends into the zygomatic process. Its roof or orbital wall is frequently ridged by the infra-orbital canal, while its floor is formed by the alveolar process and is usually 1/2 to 10 mm. below the level of the floor of the nose; projecting into the floor are several conical elevations corresponding with the roots of the first and second molar teeth, and in some cases the floor is perforated by one or more of these roots. The size of the sinus varies in different skulls, and even on the two sides of the same skull. The adult capacity varies from 9.5 c.c. to 20 c.c., average about 14.75 c.c. The following measurements are those of an average-sized sinus: vertical height opposite the first molar tooth, 3.75 cm. ; transverse breadth, 2.5 cm. ; antero-posterior depth, 3 cm. In the antero-superior part of its base is an opening through which it communicates with the lower part of the hiatus semilunaris; a second orifice is frequently seen in, or immediately behind, the hiatus. The maxillary sinus appears as a shallow groove on the medial surface of the bone about the fourth month of fetal life, but does not reach its full size until after the second dentition. At birth it measures about 7 mm. in the dorso-ventral direction and at twenty months about 20 mm. FIG. 862– Specimen from a child eight years, eight months, and one day old. Lateral view of frontal, ethmoidal and maxillary sinus areas, the lateral portion of each having been removed by sagittal cuts. Note that the sinus frontalis developed directly from the infundibulum ethmoidale. Note also the incomplete septa in the sinus maxillaris.